This “Rock’n’Roll jeans (exists in grey, too)” is one of the popular item in our shop; it’s made of very soft cotton & elasthane fabric (which makes a bit of stretch effect). 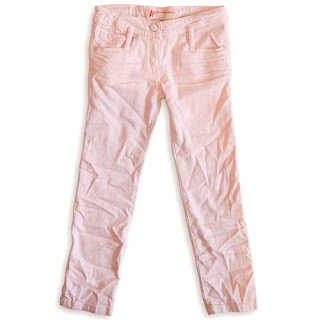 All the kids who wear this jean want to repeat wearing this every day (I am not exaggerating!) as it fits comfortably to their legs and also it’s easy to move with it. If you would like to have Californian ‘chill vibe’ styling, you can wear with “Pink Rock’n’Roll T-shirt (American Outfitters)” or alternatively “White Cassette T-shirt (American Outfitters)” like wearing a ‘boyfriend’ T-shirt. For more girly & romantic styling, how about wearing with “Floris Blouse (Queene & Belle)” and “White Vintage Headband (Le Parurière)” as a necklace?